Hello my loyal readers ! today I’ve started a new category on my blog with the name of “Bloggers Interview” where I’ll share world top and famous bloggers and entrepreneurs. This section of my blog was also my dream, because I always want to interviewed all the top inspirational and best bloggers in the world, who living a laptop style life. 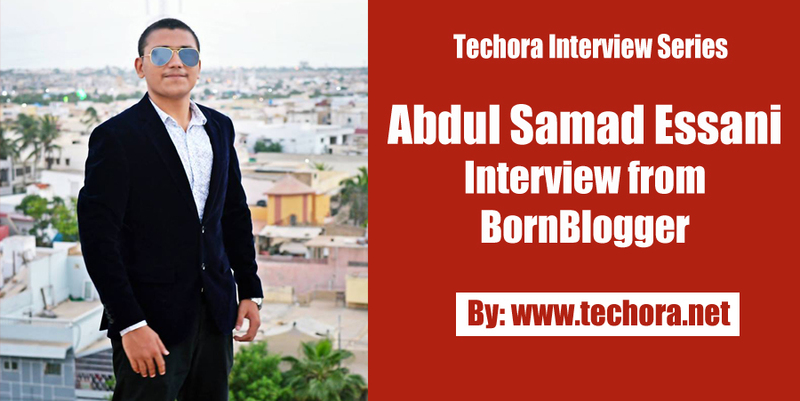 So this is my first interview with Pakistan young but inspirational buddy whose name is “Abdul Samad Essani”. He is very inspirational blogger and content writer who working as a freelancer and blogger. He managed many blogs but his own blog where he share his blogging experience with their readers called “BornBlogger.Net“. I’ve found him on Facebook, and after follow him on Facebook, I saw some best things about him. I also reading his blog where he share his blogging experience. He is very humble and interesting personality on online world, I personally interviewed himself and he didn’t neglect me. So I also very thankful to him that he gave me his time for interview. So let’s start ! ! ! 1.2 #2 – Please share something about yourself? 1.3 #3 – Blogging have different definition for different person. What is it for you? 1.4 #4 – How did you start blogging? 1.5 #5 – Which difficulties are you face in beginning level? 1.6 #6 – What are your strengths and weaknesses? 1.7 #7 – What techniques are you using to drive more traffic on your blog? 1.8 #8 – What are the best way to use social media and how everyone should use it? 1.9 #9 – After how much time you receive your first check? 1.10 #10 – Make money blogging is easy or difficult? 1.11 #11 – Who is your inspiration? 1.12 #12 – Which tools do you use on daily basis to get more work done in short time and to improve productivity? 1.13 #13 – What is your daily routine and what do you to become more productive? 1.14 #14 -Any message for my readers? Now here are some self learning and informative questions which I asked him and he answering them with full confidence. I hope you might be love this interview. Thanks buddy for inviting me here, I’m not a Pro Blogger but I can call myself a blogger with some knowledge and if you’re gonna start a blog then you don’t need to become a Pro Blogger but a blogger with some knowledge! #2 – Please share something about yourself? I’m 16 years old boy, currently living in Karachi,Pakistan. I came to blogging by seeing a sub domain of muhammadniaz.blogspot.com, I thought what actually is .blogspot.com coming in the site I Immediately opened a new tab and wrote .blogspot.com in it. I saw a blogger platform, I created a domain called abdulsamadessani.blogspot.com and copied the whole blog of Muhammad Niaz after sometime the blog was deleted by Google DMCA, it was the worst day of my life, I checked what’s the reason behind then I came to know that copying contents is not blogging, making your own content is blogging. From the day my blogs deleted I promised myself never to be a copycat and become your own identity. Now Alhamdullilah I create my contents on my one and only blog “BornBlogger” with passion to teach newbies and guide them the right path. I have now 4-5 years of experience in blogging! #3 – Blogging have different definition for different person. What is it for you? Blogging is something that can make you open minded and it’s a way to become famous. It is the way to make a living online and become your own “Identity”. #4 – How did you start blogging? As I said above, I started it by inspiring from a .blogspot.com subdomain. #5 – Which difficulties are you face in beginning level? At that time only Mohammad Mustafa Ahmedzai CEO and Founder of Mybloggertricks.com was having the tutorials from basic to advanced, He is one and only mentor of mine in the world of blogging. I never faced big difficulties in blogging because I was having the dedication to stand out and do something for my future! #6 – What are your strengths and weaknesses? My strengths are my parents and my mentors. If you think that about weakness then you become more weak and weak! #7 – What techniques are you using to drive more traffic on your blog? SEO – The first and only technique I recommended to any blogger among the blogosphere that try to learn SEO. If you become an SEO consultant then sky will be your only limit! I wrote whole guide about SEO, If you really want to become SEO expert then I really recommand you to read this! >> SEO GUIDE (http://bornblogger.net/seo-guide/). Social Media – I’m getting very much traffic from social media, it’s really a nice way to get traffic to newly made blog! #8 – What are the best way to use social media and how everyone should use it? The social media is the key to success in my mind. The best way to use social media is use it in positive way not in negative way. Don’t waste your whole day in using social media, it’s only a way to dis-attract people from their works. I’m really wasting my time on social media, if I give this much towards my blog then sky will be my only limit! Now I’m thinking to do my business rather than spending so much time on social medias. Nevertheless, this is the best and awesome way to bring traffic towards your blog if you do some smart work! #9 – After how much time you receive your first check? After 1 year of my blogging career I started getting money from blogging because I never give up and work harder and harder to make a living online! #10 – Make money blogging is easy or difficult? It’s not that easy as we think and not that difficult as newbies think. You just need to do some hard and smart work and you’ll surely get some juicy fruits (Money). #11 – Who is your inspiration? My inspiration is my mentor who sacrified very much from a Plastic bag seller to Entrepreneur, the one and only Mohammad Mustafa Ahmedzai! #12 – Which tools do you use on daily basis to get more work done in short time and to improve productivity? and the list goes on! These tools are very much good and best for client projects! #13 – What is your daily routine and what do you to become more productive? My daily routine is really bad nowadays because of lots of client projects. I wake up at 8AM or sometime 6PM, it depends on work but I love to go gym to become more productive. #14 -Any message for my readers? Thank you so much for reading this small and young man personal blogging experience. I hope you’ll learn a lot from this Bloggers Interview Series (BIS). I’ve also interview from all other best bloggers in the world. So stay tuned and for stay updated from my latest articles, subscribe my newsletters.